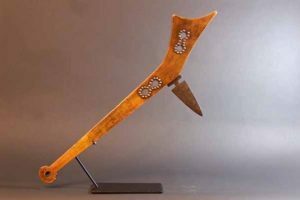 Most gunstock clubs in use by Native Americans from the late 17th – 19th centuries were loose copies (meaning the shape) were loosely copied from European firearms. Once the gun was fired, they were turned and used in the form of a club for battle. Native Americans copied the shape sometimes adding a spike of flint, horn or iron. Normally made from a think board-like piece of hardwood, surgar maple, ash, hornbeam, etc., these clubs were shaped to resemble the shape of a gun-stock. The spike was attached to the wrist or elbow area of the stock and acted as the striking point. These were made thin and light for use on horseback for the Plains Indians and became favorite of the Pawnee Indians. The original club that I replicated was made from a thin piece of sugar maple and its owner decided to construct it with a double piercing to make it more light and fast on the swing. To make it more lethal, a trade dag blade was added. To further its efficiency as a weapon, a large washer or knob was added to the end of the handle to ensure grip. Also, this club was decorated with personal totems and power symbols, possibly coming from visions and spirit animals of its owner. The Pawnee Indian who made this club used tough buffalo rawhide in a double twisted form to use as a lanyard to additionally ensure its effectiveness. Its final presence as a lethal weapon, was personalized with a horse hair drop from the warrior’s personal war horse. Check the replica of this gun-stock war club that I made for more information. These clubs normally were very personal to their owner and were used throughout their life and passed on to be used by their relatives, from generation to generation. These were highly prized and spiritual possessions of the time. Read more about the Pawnee Indians and gunstock clubs. Copyright © 2017 Wild Works, Ltd. All Rights Reserved.